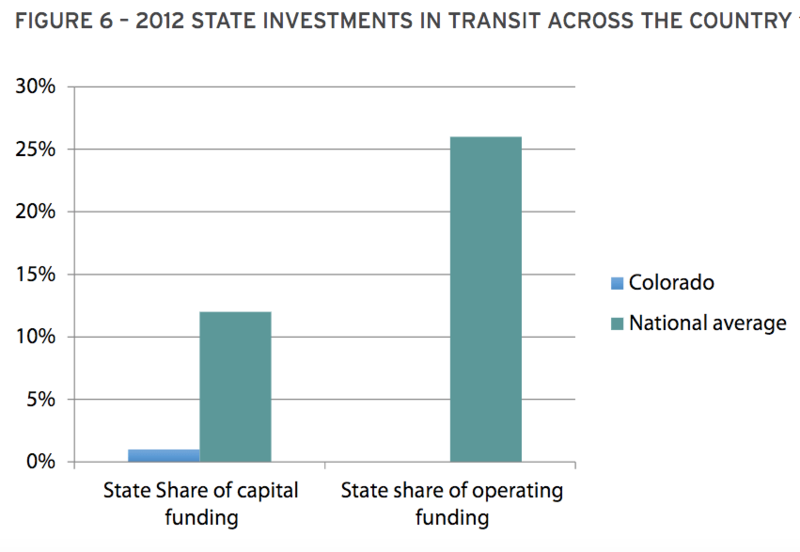 Investing in transit, walking, and biking infrastructure has never been more urgent in Colorado. With the state’s population projected to grow by 2.4 million by 2040, Colorado will choke on its growth unless Governor John Hickenlooper and state and local leaders change course, according to a new report by the Colorado Public Interest Research Group and the Southwestern Energy Efficiency Project [PDF]. “Without significant investments in transit, biking and pedestrian services and infrastructure, Colorado will not be able to meet the demands and challenges of our shifting demographics and growing population, and will miss out on the many benefits transit, walking and biking provide,” the authors state. Making it faster, safer, and more convenient to get around without driving would also make Coloradans healthier, happier, and more financially stable, the authors write, but the state is failing to allocated the necessary resources. To properly build out infrastructure like sidewalks, bike lanes, and transitways, Colorado should invest about $1 billion annually for the next 25 years. Some of that money could also fund better transit service to and from ski resorts, making it easier for city dwellers, suburbanites, and tourists to go car-free or car-light. Here are some of the things Colorado needs to do to bring things up to snuff, and how much the state needs to spend each year, according to the report. 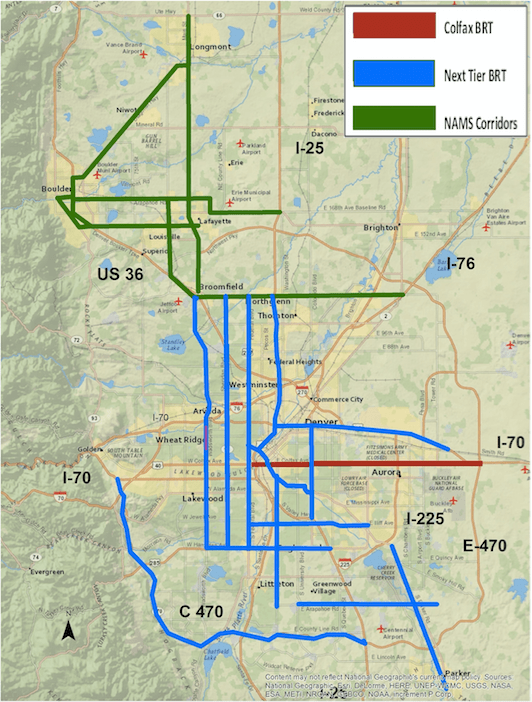 Launch 14 bus rapid transit lines in metro Denver — $134.6 million annually. Build 6,000 miles of new sidewalks and repair 8,600 miles worth of sidewalks in urbanized areas, and maintain the system — $243.6 million annually. Bring every city’s bike network up to the “standard of the state’s best communities” (read: Fort Collins and Boulder) with protected bike lanes, bike-friendly intersections, signage, and parking — $100.8 million annually. Grow transit ridership by 100 million trips each year by investing in “fare-free” pass programs like RTD’s EcoPass — $187 million annually. Expand bike-share programs to increase access — $11.3 million annually. Provide frequent bus service with express lanes between Denver and ski resorts to transport 2.1 million people a year — $135 million in up-front capital costs, $20.2 million in annual operating costs. Build regional bike routes that connect cities and towns, and safe highway shoulders for rural riding — $117.4 million. Improving transit, walking, and biking is not only necessary to manage growth, it’s better for Coloradans physically and financially. Car ownership is generally a household’s second-largest expense, and costs the average American about $8,700 last year, according to AAA. Making it easier for residents to own fewer cars “can help cities remain more affordable and help offset higher housing costs,” the report states. Redesigning streets for safe walking and biking would also help Colorado chip away at the very solvable public health crisis of traffic deaths and serious injuries. Last year, 488 people were killed in traffic on the state’s streets and highways. The report touches on air quality, too, noting that almost 50 percent of Denver’s ozone-degrading pollutants come from vehicles. These reasons are well-established. So how will Colorado get another $1 billion each year? It will take a combination of prioritizing sustainable transportation with current money, passing local taxes and fees, and probably raising the federal and state gas taxes — both stagnant for 20 years — according to the report. Aside from finding new funding streams, policymakers need to rework rules that funnel money into highway and road projects instead of more efficient modes like transit. For example, state law compels Colorado DOT to spend state gas tax revenue and the majority of vehicle registration fees on highways. Lawmakers should also require revenues from toll lanes to fund transit in the same corridor, the report recommends. I’m interested in the bus trips to the mountains. I personally do not participate in the winter sports due to the traffic to the mountains in the winter months. I also think true BRT would serve the area well if we had only BRT dedicated lanes along certain corridors as the map depicts. More cost effective than commuter rail. It is insane that CDOT runs buses up to the mountains on i70 but travels east in the morning and west in the evening. There would be huge demand from skiers if they ran at the appropriate times. I’m actually surprised that no private companies have stepped up like has happened in Boston- http://www.bostonskiandboardbus.com/. Vail and Breckenridge have done a good job of enabling us to get around car free, if only we could get there from Denver. This would also eliminate one of the chief excuses for not getting rid of our cars in Denver, that we need them to get to the mountains. The reason they don’t run a ski bus west is because of traffic it would be too unpredictable. There are a few buses that go to Loveland and Winter Park that are private. And you can also take Colorado Mountain Express to any mountain, which is a very expensive option. That said with the parking problems that Breckenridge and Vail have during ski season it would make sense to offer a ski bus service. That first chart is what interests me. If we could spend on non-car modes what the average state spends it would work out to massive investment in those modes. The improved infrastructure and capacity from transferring 10% and 25% of our dollars to transit, walking, and biking would result in huge gains in those modes. Gains which some folks now say are impossible, and they’re almost right considering the share of funding they receive. One of the problem you’ll constantly run in to is that people love their cars. They don’t want to go car-free or car-light… even if you show them the benefits, they don’t want to do it. When dense housing is built, the complaint from most neighbors every time is “where am I going to park with all these new people?” It’s unfortunate (I just moved closer to the city center, and take transit or my bike every morning), but that’s the road block we’re running in to with convincing the neighbors. Not everyone who lives in the city works in the city. Many of us commute to suburbs or even farther, then come home to the city each night. We love living here, even despite the fact that it is difficult to drive sometimes. But why should we be forced to move outside of the city to some boring suburb just because we actually need a car to make a living? Who said anything about forcing you to move out of the city? Cities are, by their very nature and intent, congested with a mix of people who live there and people who work there. Making it easier for people to move within the city — and making it easier for people to move from the city to the ‘burbs for work — is a must. You comment about requiring parking, was implied that living with a car is not an option in the city. I’m sorry if I misunderstood you. No worries. It certainly is an option. My wife and I share one car, and it works very well for us. We both get to work without one most days, and use car services (car2go is super easy) when we need a lift somewhere. I understand it’s not an option for everyone. But more transit options (i have no idea what you do for work) do reach the suburbs. Relaxing on the bus or train is pretty solid. Give it a try, even just once, see if you like it. I have taken the A line and enjoyed it. But I’m a project manager, and when I’m not commuting to my office in Centennial, I’m visiting projects anywhere from Boulder to Colorado Springs, Lakewood to Aurora. Taking public transport is just not time-efficient. Would love to see a Colfax BRT!